After publishing my introduction to Spoonie Veg post, I received some really interesting and helpful perspectives from readers, both on my blog and in Twitter conversations. One thing that came out of this was that I realised a post on where to grow your fruit and veg might be useful, before starting on individual plant posts. As Michelle said 'spoon ratings may apply to techniques as well as particular veg'. Therefore, based on my experience and some tips from readers, this is an overview on growing in raised beds and containers. In all honesty, I really think the easiest way to grow if you have room, (whether you have a chronic illness or not), is by using raised beds. Yes there is the initial work in getting them set up which is Spoon-heavy, I confess. But, with help, once done they are much easier to manage. I use Link-a-bords, which are made from 98% recycled uPVC. Whilst they aren't as attractive as sleepers or wooden borders (see picture above, from my garden this week), they are easy to put together and basically need no maintenance, the latter a big plus in my view. They are also an easy way to implement a no-dig* regime and I have found they really do keep weeds to a minimum. The 'con' is that you do needs funds for the initial outlay, so if that's an issue, going through local skips for wood that is being thrown away is a cheaper option. But then you need the Spoons to scavenge, you may need access to a car to cart your wood home, etc. Like everything with a chronic illness and a tight budget, you have to weigh up your options and spoons. c) it's means less leaning and therefore is better for my back. Less leaning is also less spoons. Michelle also finds raised beds are much easier to cultivate on her clay soil and I think that's a good general point about clay soil. Why spend so much time and spoons digging and then trying to improve the heavy clay soil, when you can build raised beds on top of it and add in all the good compost and manure that way. Helen Gazeley also suggested that putting in an irrigation system can also reduces spoons. This is something I hadn't thought of when I designed my garden, and I wish I had. This would remove a lot of time and spoons you need to spend on watering, as it's just a case of turning on and off a tap. Something to seriously consider if you are planning a new garden. When I have the funds, I'd like to retroactively add a irrigation system to my raised beds. Raised beds get a rating of 1-2 spoons if they are permanent beds that need no maintenance other than you added more compost/manure once a year. A 4-5 rating is for those raised beds that may be permanent, but need ongoing maintenance every few years. This would be if you have build the beds with thinner wood that need either wood/varnish paint/protector or even replacing every few years. The 4-5 rating would only apply once in a few years. Of course, if you are unable to set up raised beds, or don't have that much space, then container growing is the answer. 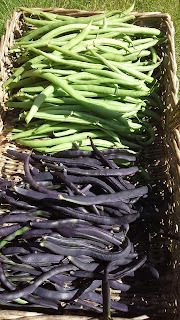 in a medium-sized wood container, dwarf french beans growing in plastic containers. Containers are a good option if you have limited space as well as limited energy. They can be large planters, as above, which stay in that place, or smaller containers like the plastic ones which fit into smaller spaces and can be moved more easily. Because I don't have a large garden and have limited options for catching the sun, using containers gives me more growing space than I have with the raised beds alone. 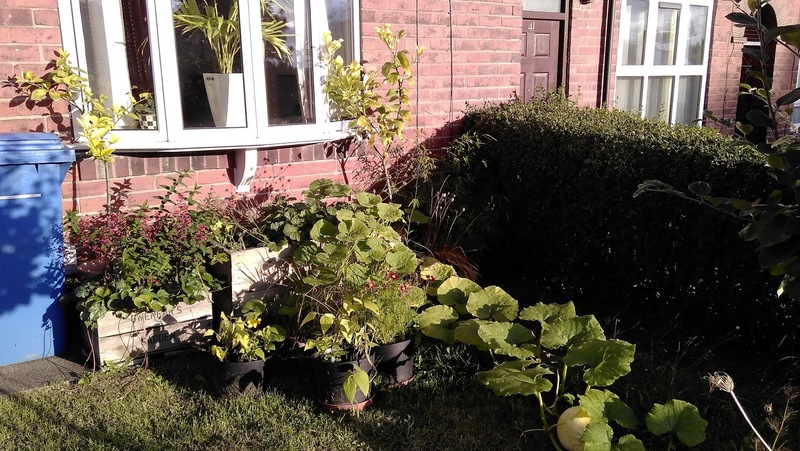 For example, the driveway is concrete and gets quite a bit of sun between April and September, so it's ideal for placing containers there, maximising the sun's warmth in this limited space during this period. The car gets parked further down into the shady area. 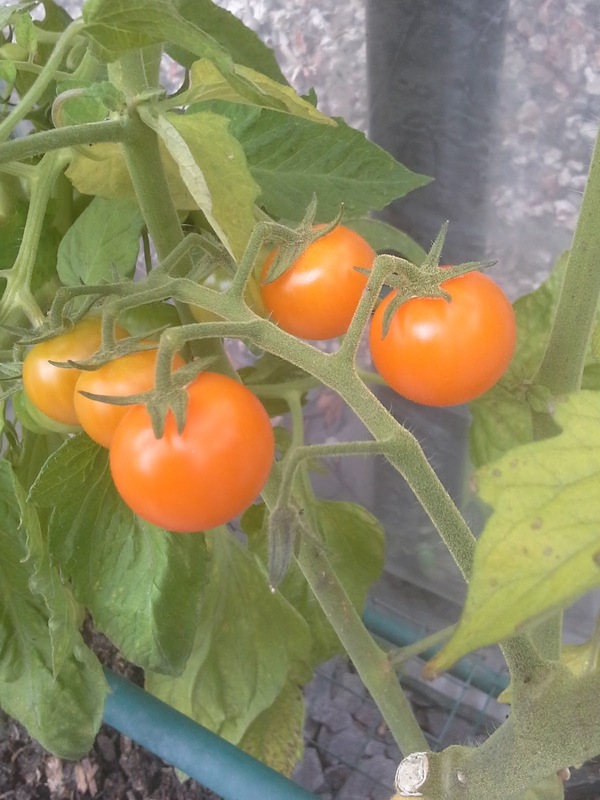 There were some great suggestions from readers about growing specific veg in containers. Helen finds it much easier to grow potatoes in containers. And I was challenged by Helene for my high spoon score for tomatoes. 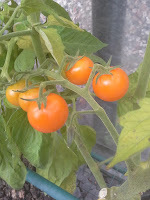 She grows tumbler cherry tomatoes in a window box, requiring no pruning, pinching or staking, just watering and feeding. Container growing is also beneficial when it comes to fighting some pests. Matt has found growing baby carrots in containers has been a great way to avoid Carrot Fly. On the other hand, Janet doesn't bother growing carrots in neither raised beds or containers, and instead focuses her limited spoons on veg that increases considerably from one seed. One carrot seed, one carrot. One bean seed, lots and lots of beans. This is a useful way of maximising yields from energy spent. Containers get a Spoonie Veg rating of 1-2 as it's mainly filling with compost and sowing, watering and occasional feeding, then emptying compost when the annual fruit or veg has finished growing. To save on compost, you could reuse it next year, mixed with some new compost/manure, for a different crop, or put it on your flower beds as a mulch. 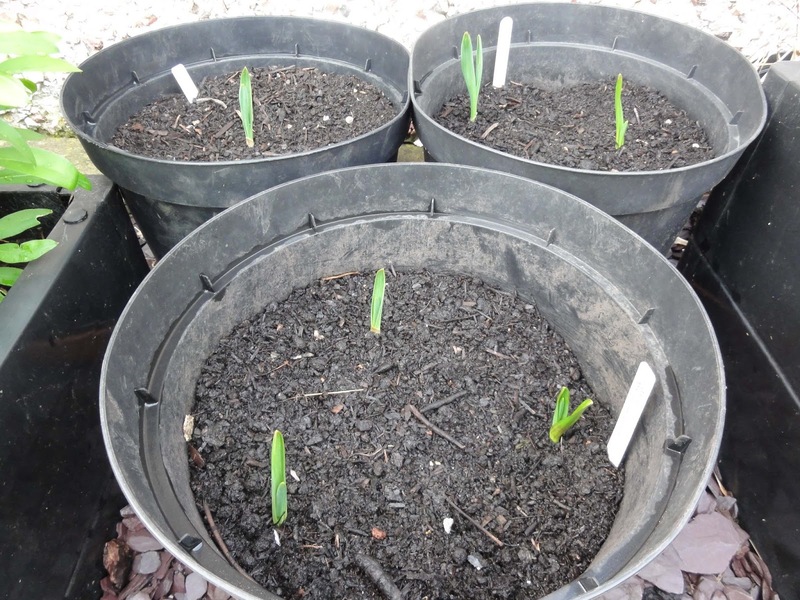 I'm experimenting growing garlic in pots. One pot has 1 clove, the second has 2, the third, yep, has 3. I hope to work out the optimum number that develops good sized bulbs in a 10 litre container. However, containers get a rating of 3 when you have a lot of containers and combined with a dry summer and need to do a lot more watering. In this case, fruit and veg grown in raised beds usually needs less watering as they can send their roots out deeper into the soil to access water and nutrients. Container grown plants cannot do this and you need to water them more often, which increases their Spoonie rating in this instance. I've tried to capture most of the key issues from a Spoonie Veg perspective for growing in raised beds or containers. Please leave suggestions below if you have other points that you feel should be included. 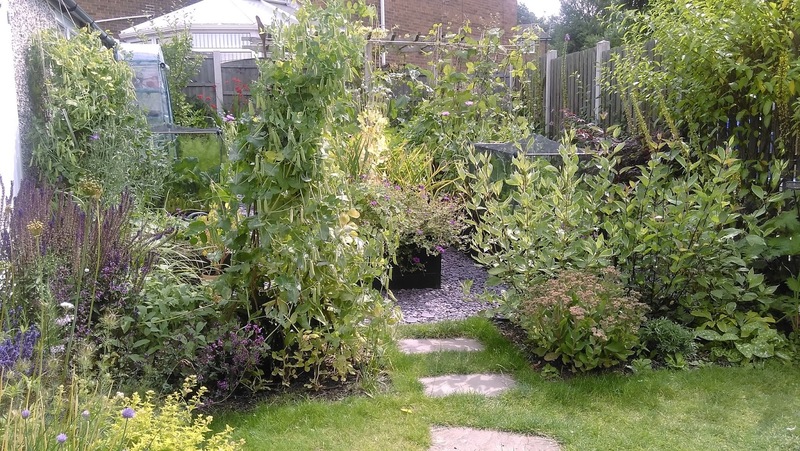 *If you are new to no-dig, visit Charles Dowding's site where he gives information about the many benefits of no-dig. From a Spoonie Veg perspective, no-dig immediately removes a lot of work from growing. On one of the recent Big Dreams Small Spaces (where the daughter had ME) they went to visit a hospital garden where they had a huge raised bed on castors, which they could wheel (slowly) around the garden and bring the plants to the patients. With that in mind I wonder if, for people with a lot of hard-standing and paving (so not so much soil), putting containers on wheels or wheeled platforms might help. 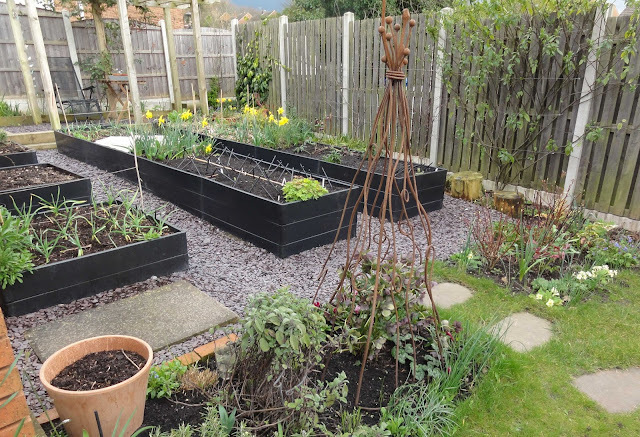 I love my raised beds (not that I grow fruit or veg) and can plant a few small plants in one day in the raised beds whereas planting one thing in the ground generally takes two - three days. The added advantage of the raised beds I have (made from sleepers) is that I can sit on the edge of them when planting/weeding as well as when having a little rest or a cup of tea. I try to remember to buy plants in smaller pots because as well as being cheaper, they're also easier to plant (you need a smaller hole!). My mantra for buying plants, particularly if they're going in the ground is 'the bigger the pot it's in, the bigger the hole you have to dig'. Obvious, but very relevant! I find containers hard as they need more regular watering in the summer (assuming it's warm!) and I find fighting with the hosepipe tiring (although not as tiring as going back and forth with the watering can. Although at least I get a sit down while the can is filling! ), but it does mean I have grow plants which wouldn't survive in my garden, or would get lost among other plants. I have a collection of alpine pots which are 8 or 9" in diameter so I can easily move them to a more sheltered spot in the winter. My other pots don't move and so contain plants which are more tolerant of very wet winters! Sorry for the rambling comment. I'm sure I had a point when I started, but I'm no longer sure what it was! I can see what you mean about the increased effort for containers in dry weather. Could you rig up some sort of automated watering from your new giant water collector? As for watering – I am determined to install a soaker hoses system in my whole back garden this year. It will be a big expense but hopefully it will be as useful as I hope, saving me hours and hours of watering and saving water too. Super post, and thank you for the mention, Julieanne. I'm sorry it's taken me so long to catch up with this. 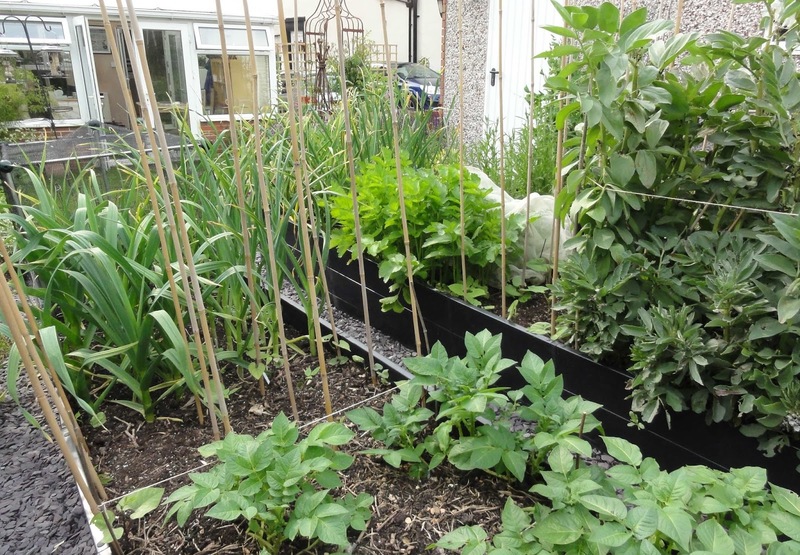 The other thing with raised beds is that they're easier to net, I think, which prevents varmints (foxes are very active where I am) from fossicking around among the vegetables and leaving deposits.